Cortisol is an important hormone in the body secreted by the adrenal glands and involved in the regulation of glucose metabolism insulin release, immune function, inflammatory response and blood pressure. Cortisol is referred to as 'the stress hormone' because it is secreted in higher levels in stressful, 'fight or flight' situations to give the body an extra boost of energy for survival reasons. When the stressful situation has passed it is important that the relaxation response be triggered so that the body may be returned to normal cortisol production levels. Unfortunately, in our high-stress culture our body's stress response is activated so often that the body does not have a chance to recover, resulting in a state of constant stress, characterized by the presence of higher levels of oxidative free radicals. Chronic stress, as evidenced by higher and more prolonged levels of cortisol in the bloodstream, has been shown to have a host of negative effects like impaired cognitive performance, blood sugar imbalances, lowered immune response, suppressed thyroid function and high blood pressure. Chronic stress and negative feelings also speed up the aging process and increase our risk for more severe degenerative diseases like cancer, heart attacks and diabetes. RENUTRIOL features a potent combination of ingredients designed to trigger the relaxation response and help the body recover from harmful stress levels and combat oxidative states by the neutralization of free radicals. 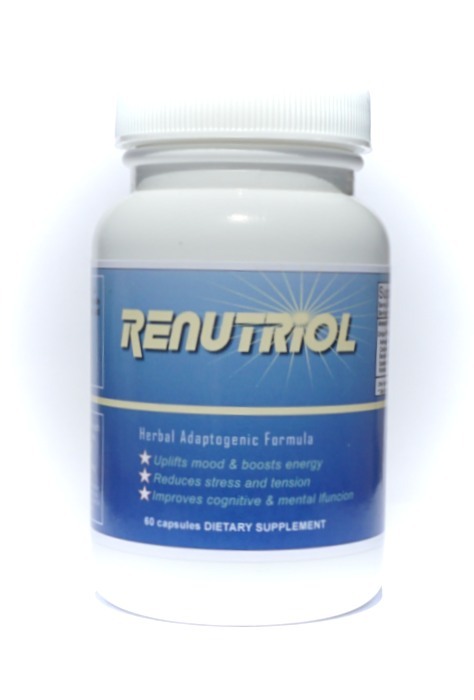 RENUTRIOL' s proprietary blend is scientifically proven to affect many parameters of health and wellness. These include, reducing the risk of cancer, heart disease, diabetes, loss of mental faculties, and even the aging process itself. Renutriol's combination of effective nutrients also helps optimizes brain neurotransmitters to help attain better concentration and focus. This is an excellent product to use stand alone to improve mood and help maintain optimal health or in conjunction with any of our mood enhancing products as a cycling agent to increase their effectiveness over time. RENUTRIOL features high potencey Sceletium tortuosum (kanna) combined with Bacopa, Rhodiola, Ashwaghanda and other key herbs known to help reduce stress and depression and their energy robbing effects on the body. It can help you stay positive, focused and energized to optimize your performance anytime you need to.